One major barrier to more effective recycling is consumer confusion on what can be recycled in their bins at home. 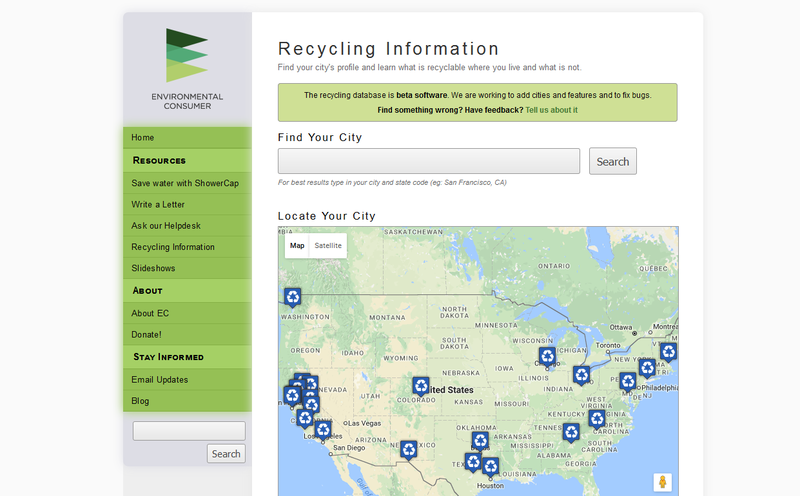 With Environmental Consumer, I set out to build a database of recycling information for cities in the United States. We started with the top 25 cities by population in the US along with a handful of others we chose, and built recycling profiles based on our research from municipal websites. We created profile pages for each town that had icons for what was recyclable as well as narratives for any extra information or caveats and links to more information on the municipal website. At the time, there were other databases of recycling information, such as from Earth 911, but they focused on places you could go to recycle items, rather than on reducing confusion at home – they have since expanded their efforts in those areas (and do a great job! ), and as a result of that and limited resources, we’re not supporting our own database anymore. The application is built in Perl, and generates standard HTML and CSS pages. Mapping uses the Google Maps API. It is backed by a MySQL database.